Welcome to the December 2018 edition of the SkyDemon customer newsletter. The flying season has reached its quietest stage, we’ve just moved into a new purpose-built office and are busy working on lots of behind the scenes stuff as well as a few exciting new features. Read on for more information about these and what we’ve been doing over the last few months. SkyDemon has always logged your flights automatically, detecting your takeoff and landing and recording the times for posterity. This behaviour remains unchanged but we’ve added some extra tools for enhanced logging where this is desired. As soon as you hit Go Flying, assuming you’re on the ground, you’ll see two big buttons in your virtual radar, one to log engine start and one to log off blocks. If you get into the habit of logging your engine start and stop, SkyDemon can take care of the blocks logging automatically by detecting your movement. After your flight, all these timings (engine, blocks and flight) can be inspected in the Debriefing Pack and reported on. The Log Summary tool has been improved to work with all your logs at once, through the cloud, whereas before it would only report on the logs stored on one device. It’s never been easier to see what aircraft was used, add up the engine hours for its tech log or see how many hours you’ve flown in any given time period. For a few years we have offered approach tools, where you could select your destination runway and circuit join and SkyDemon would depict a generic circuit and join, for orientation purposes. These tools were not particularly discoverable and we found a lot of users simply didn’t know about them. In the most recent version of SkyDemon we’ve made huge improvements to the approach tools and introduced new functionality. There’s now a “Make Approach” button at the bottom right corner of your screen when you get close to your destination. This lets you select a visual approach with a circuit join, or an instrument approach which is then overlaid on the chart. When you select a visual approach, we show you the circuits available for your selected runway. These are automatically filtered by traffic type, if you’re flying a microlight or helicopter. SkyDemon preselects the most likely circuit, to minimise the number of screen touches required. When you’ve chosen a circuit, circuits for other runways are hidden (where present) for clarity. We also now truncate your magenta line when you’ve chosen your approach, so it doesn’t interfere with circuits and other traffic guidance right next to the airfield. We have always led the way in graphical NOTAM depiction technology, and this means constantly adapting to the varied NOTAM output of the various agencies across Europe. 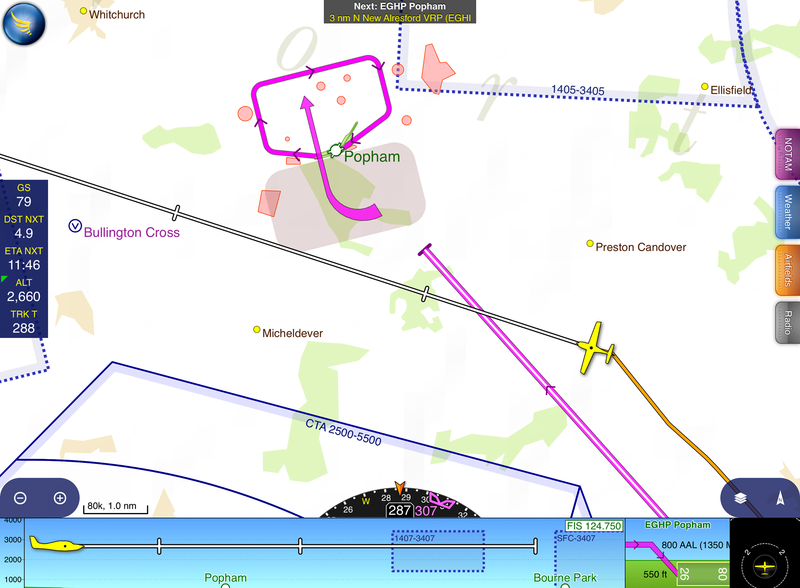 We’ve improved this over the last few months so that more NOTAM than ever are automatically depicted in SkyDemon. TerrainSafe was renamed to Colour High Terrain back in the summer, and made available in planning mode for the first time. Tremendously useful for planning mountain flights, it can be switched to any desired altitude and your safe passage through mountain valleys and passes can easily be checked with the colouring. 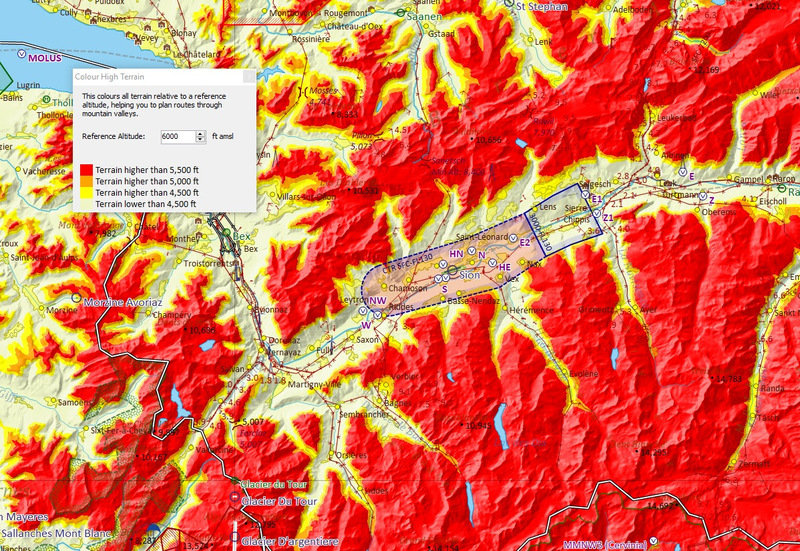 We’ve also added an explicit key so you can see exactly which colours correspond to which terrain elevations. We’ve recently added 65 professionally designed aircraft performance profiles to our library in SkyDemon. These have been modelled down to the finest detail and include precise speed and fuel consumption figures for all altitudes at which each aircraft can fly. The next version of SkyDemon has a switch to make the download of documents for airfields that are part of your route fully automatic. When you go flying you can be confident that all charts and information for your airfields are cached on your device. FLARM decoding is now part of SkyDemon. This is an agreement we have reached with FLARM that allows us to decode raw FLARM signals from gliders and other aircraft, when coupled with a compatible traffic receiver such as the uAvionix SkyEcho 2. More information can be found at the link below. This Christmas, make a friend or relative happier and safer by giving them the gift of SkyDemon. Our gift certificates are very popular at this time of year and cost only £139. When redeemed, they grant a year’s worth of SkyDemon personal subscription, and the redeemer can renew for the usual price of £89 in their second year. To purchase a gift certificate, click on the link below. We send them out by first class post every working day. It’s great sharing our news with you in these newsletters, but since I spend most of my time writing SkyDemon, I can only send them every few months. They go out to well over a hundred thousand European pilots. We post updates on Facebook much more often – every week or two – sharing information about what we’re working on and asking for feedback about new ideas that we come up with. You can find our page at the link below; simply click « like » to be kept informed.